The big picture for North Dakota, speaking in terms of demographics, was very positive. Average age fell and population increased. This situations were a stark contrast to the circumstances when I arrived in North Dakota in 2001. 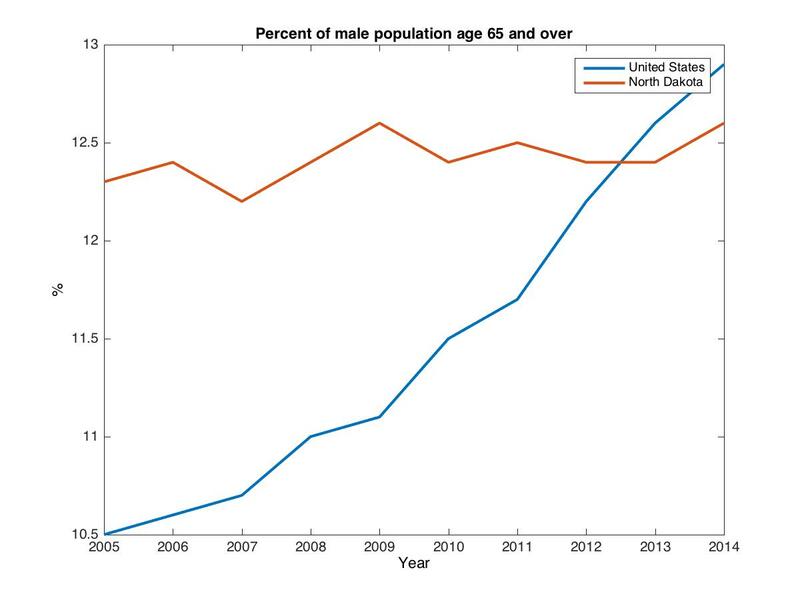 At that time the concerns were that North Dakota was greying faster than the country as a whole and that it was a trend that would not reverse. Well it did change, if not actually reverse as my first graph shows (all data available from the American Community Survey). 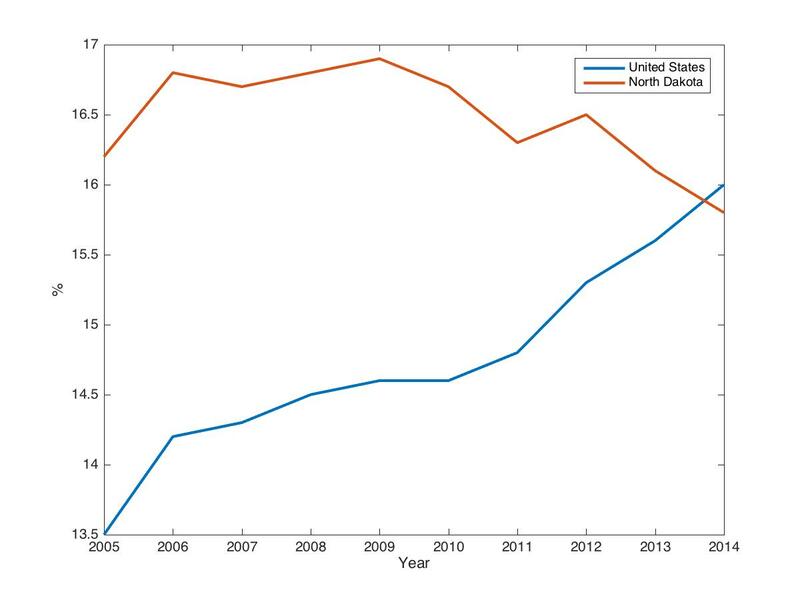 For the total population we saw North Dakota somewhat stabilize as the US increased in an almost linear fashion. 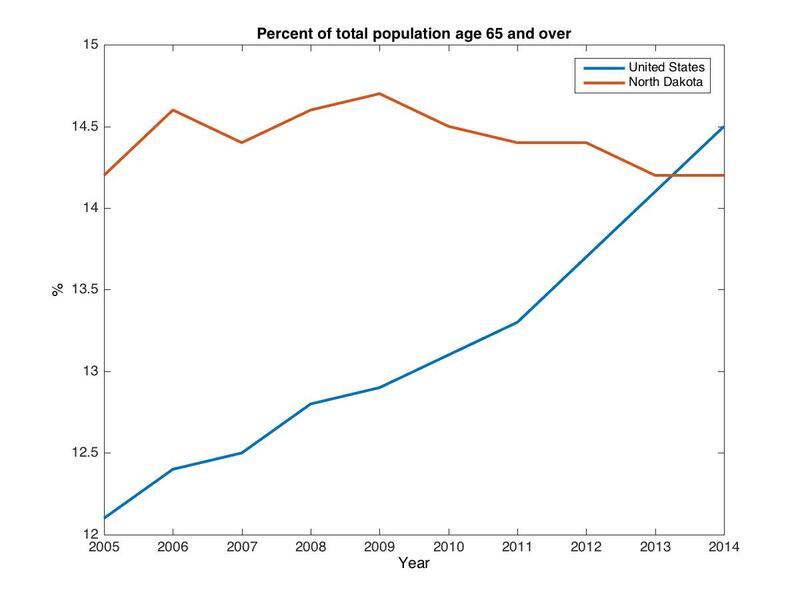 The result was that in 2014 the US actually had a higher percentage of the population 65 or older than the state of North Dakota. We can look at this broken down by gender as well. The picture here looks almost the same as the prior graph. Interestingly, the percent of the male population 65 or older starts to increase at the end of this interval too. The situation with the female population is even more pronounced. For females the decline in the percentage at 65 or older was more pronounced than for the males. For both males and females we see a significant decline in the percentage 65 or older. The reason for the decline is due to the large influx of younger people, presumably brought in by North Dakota’s job opportunities. I started this off suggesting that there was something that worried me. There is. My big concern is that we have not yet secured the gains to be had from the changing age structure of the population. This is commonly referred to as a demographic dividend. Some of my recent work attempts to quantify the dividend in North Dakota, as well as determine the likely persistence of the dividend. Will North Dakota see a sustained benefit from the changed age structure? The jury really is still out on this right now. We need more data about who is leaving now that oil prices experienced a dramatic decline. Will the age profiles converge or reverse directions? Forecasts are very sensitive to the assumptions underlying the models which does not help us with policy conclusions at this time. So that is what worries me right now, that the gains made in economic circumstances, specifically those due to the changing age structure in the state, will prove fleeting and a missed opportunity for North Dakota.